The Chinese qin 琴, a zither-like instrument, can be traced back about 2500 years ago through archaeological evidence, and has a textual history dating back even further. As an instrument associated with literati and sages, we see a wealth of references to it in poetry, mythology, historical and semi-historical accounts, and philosophical exegesis. The first example of a written record of music for the qin, however, does not appear until the early Tang dynasty (7th century). This earliest prose example details the hand positions and movements the performer must enact to accurately produce the right notes. By the late 12th century, we have examples of these prose directions condensed down to a single, character-like tablature for each note. This event will alternate between a lecture, led by ISM Fellow Kelsey Seymour, and a musical demonstration, offered by Peiyou Chang 張培幼. The evening’s discussion and performance will take us through the conceptualization and use of qin tablature with demonstrated examples from an expert performer on the instrument. In particular, we will explore the ways in which musical sounds are visually represented, how the representation of musical sounds is tied to the representation of verbal sounds, as well as the kinds of information a musical score can convey. Following the talk will be a short performance of qin music. Kelsey Seymour, an ISM Fellow, received her Ph.D. in East Asian Languages and Civilizations from the University of Pennsylvania in June 2018. At Yale, she will expand her dissertation, “The Buddha’s Voice: Ritual Sound and Sensory Experience in Medieval Chinese Religious Practice,” and prepare it for publication. The project explores chanting practices surrounding Chinese Buddhist texts during the Six Dynasties and Tang periods, and how these sonic activities and aural experiences affected not only people’s religious lives in a ritual context, but also the larger role of chant in the lives of medieval Chinese Buddhists, both lay and monastic. Peiyou Chang 張培幼 is a performer, educator, and scholar based in New York. 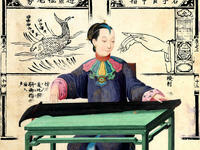 She began studying qin under the tutelage of the Taiwanese master Yuan Jung-ping, the founder of the New York Qin Society. She has performed and lectured on qin in North America, Europe, and East Asia, most recently at the School of Oriental and African Studies (SOAS) China Institute in London, for the inaugural London International Guqin Festival.